Experts understand that it takes more than a single strategy or program to ensure security for government operations. Proven strategies include protecting personal information, databases and servers, locking down endpoints (like laptops and notebooks), and continuously training employees about the ins-and-outs of increasingly dangerous social engineering threats. And protecting government networks takes a special strategy. IT administrators must accommodate potential access to various levels of secure networks, depending on the message and the need. This is known as multi-level computing.The various levels of protected information networks include NIPRNet (private IP network), SIPRNet (classified), and JWICS (top secret). 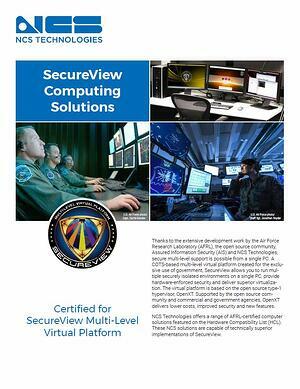 When knowledge workers routinely access these multiple networks in a given day, they often use SecureView, developed by the Air Force Research Laboratory (AFRL) and implemented by NCS Technologies. SecureView runs multiple securely isolated environments on one PC or workstation, with hardware-enforced security. This security solution is the result of extensive and continuing development work by AFRL, the open source community, Assured Information Security and NCS Technologies. SecureView provides local application execution and concurrent access to multiple security domains. This supports mission requirements, giving analysts the needed performance to run advanced applications, assess threats and share findings across agencies. NCS Technologies systems approved for use include the Stratus MT and Stratus DT desktops and the Vortex MT and Vortex MDT workstations.